Try a neat twist on an old favorite when you make a batch of Creamy Garlic-Green Bean Casserole. 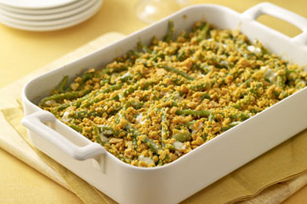 Creamy Garlic-Green Bean Casserole features a creamy, garlicky sauce and a topping of buttery crushed wheat crackers. Combine first 5 ingredients in large bowl. Add beans; mix lightly. Spoon into 13x9-inch baking dish. Mix cracker crumbs and butter; sprinkle over bean mixture. Prepare using 8 cups steamed trimmed fresh green beans. To prepare green beans, trim and discard the stems and ends from the beans. Wash just before cooking. Use a large enough pot or microwavable dish to avoid overcrowding the beans. Cook the beans just until crisp-tender. Overcooking robs them of their bright green color and fresh flavor.